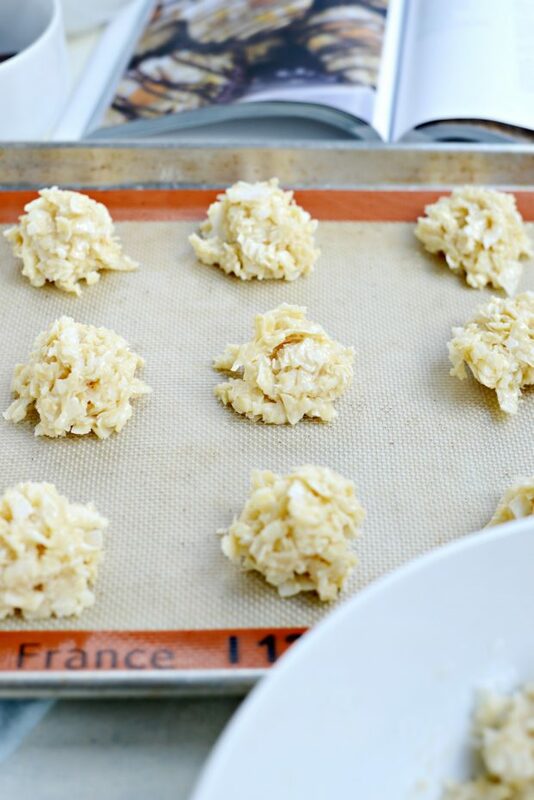 These almond macaroons are crazy easy and majorly delicious! 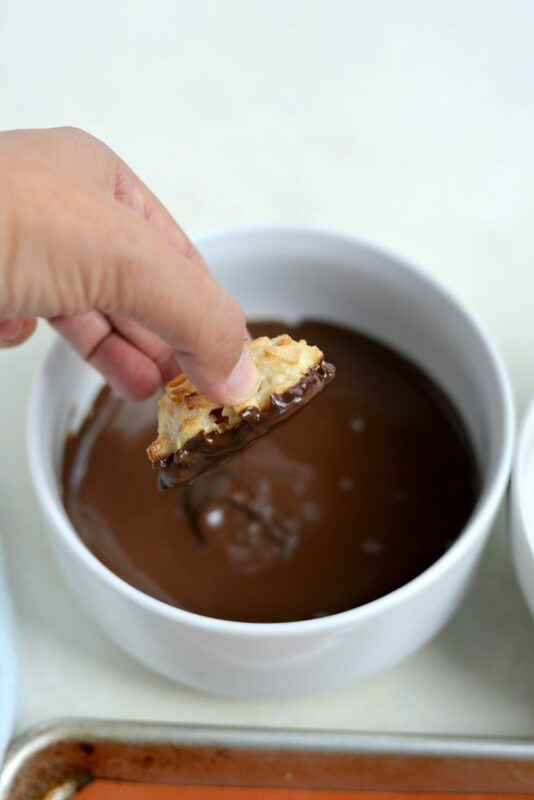 Tender and chewy coconut cookies dipped and drizzled with chocolate. You guys, I have some pretty awesome blogger friends. My friend Hayley Parker is one of them. 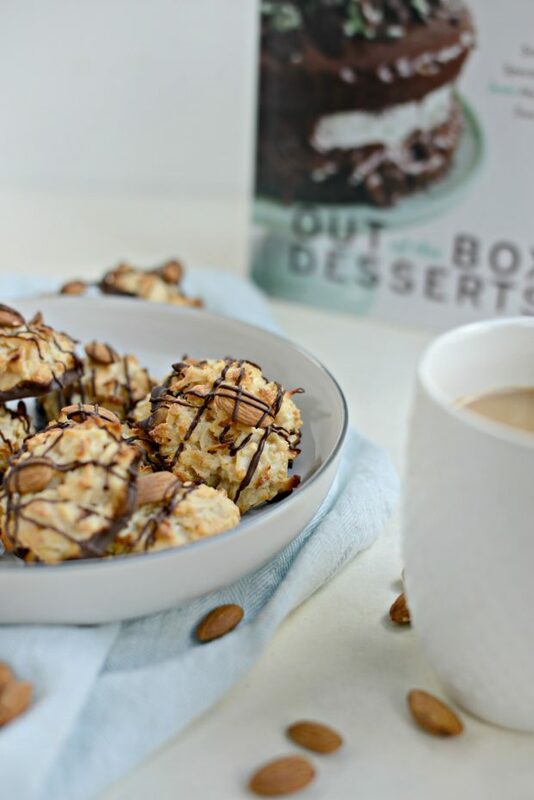 She’s the super creative mind and talented blogger behind The Domestic Rebel and author to the newly published cookbook, Out Of The Box Desserts. If you have a sweet tooth, Hayley is your gal. 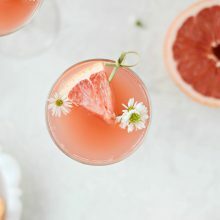 Her blog has oodles of sweet treats no matter what you’re in the mood for and her book is no different. Hayley’s book is filled to the brim with fun, easy, mouth-watering, semi-homemade dessert recipes. If you or anyone you know loves to bake or has a major sweet tooth,then this book is a must have and great gift idea. 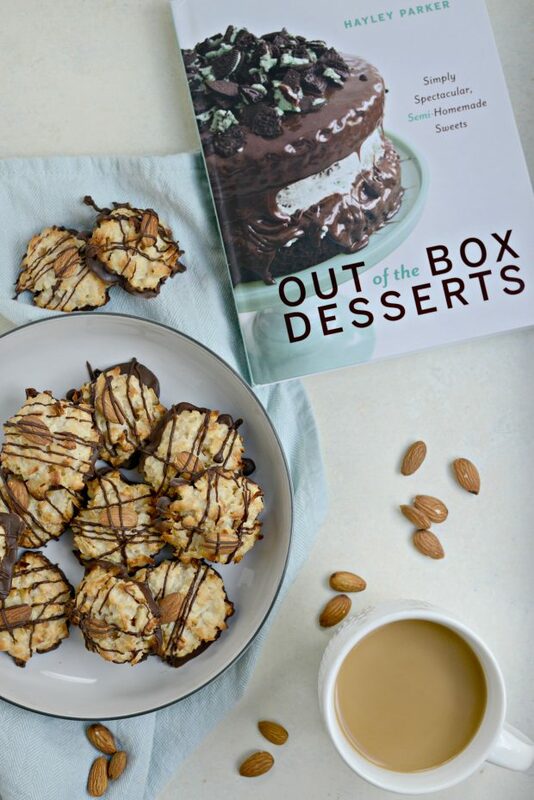 With chapters like Sweet-Inspired Cakes, Cupcakes or Chewy, Crispy and Everything Good Cookies (drool) and Brownie Bombs and Candy-licious Confections, I can guarantee you or they will love this book. When I received my copy in the mail, Haileigh (my now 15 year old – WHAT?) 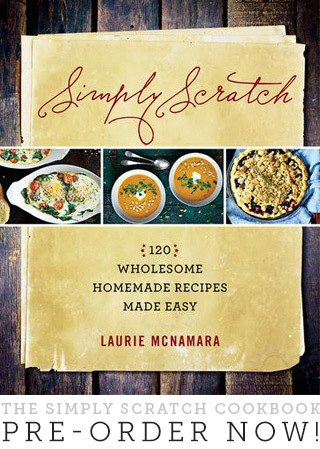 immediately started thumbing through it, marking all the recipes “we” need to make with a sticky note. She says “we” but what she really means me. But hey, I’m okay with that, I’ll just make her do the dishes. When I finally could pry the book out of her kung-fu grip (name the movie!) I easily picked a dozen or so recipes; Margarita Pie- um, yes. Red Velvet Truffle Brownie Bombs- I’m totally down. 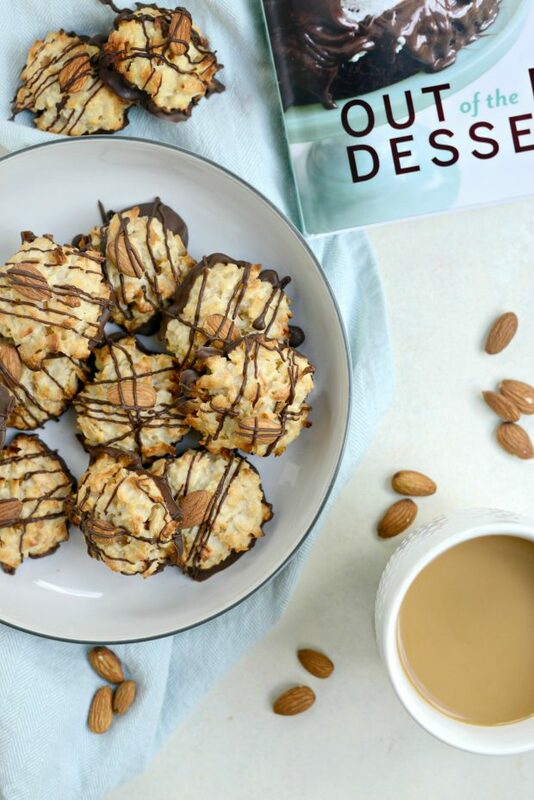 But my eyes lasered-in on these Joyful Almond Macaroons (not to be confused with macarons) because a) I’m forever-and-always in love with all things coconut and b) I’m like an almond joy f-a-n-a-t-i-c. Both of my daughters know that I’ll happily take their Almond Joys off their hands and out of their Halloween bags, they don’t even need to ask. c) I’ve also never ever ever made macaroons in my life. <—-how is that possible? I have no idea. Therefore I did not know how easy they were to make. I also did not know the magic that is sweetened condensed milk or almond bark, for that matter. 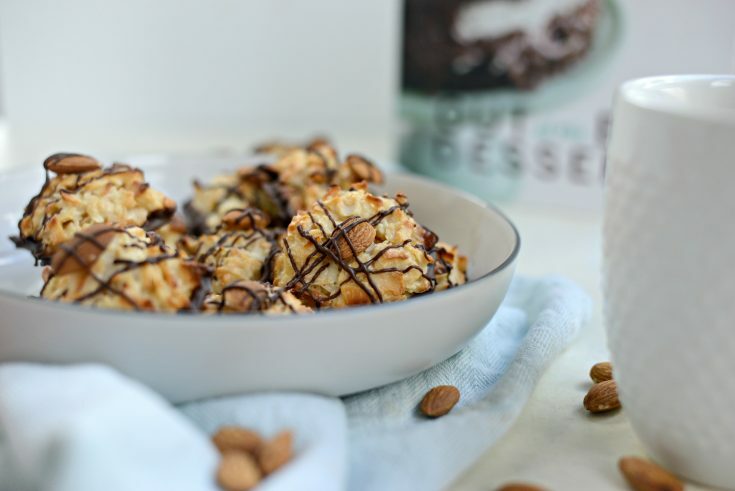 I do know that you can’t go wrong with the combo of almonds, coconut and chocolate- so it’d have to be killer, right? So first up, mix together the coconut and flour. 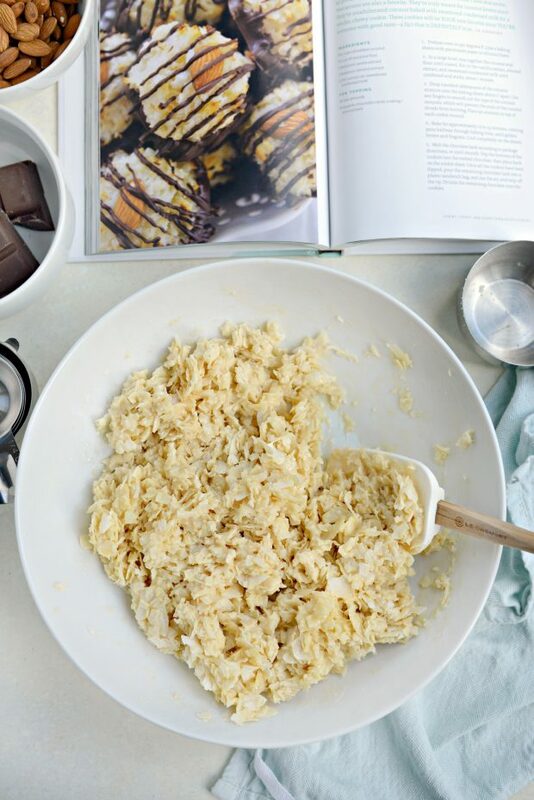 Hayley’s recipe calls for 5-1/2 cups of shredded coconut. I’m using Bob’s Red Mill so I scaled down the amount because they are bigger pieces of coconut. I used 4-1/2 cups. Next add in the sweetened condensed milk, almond and vanilla extract. Give it a stir and that’s it! I must admit, both my girls and I sampled this coconut concoction. Amazeballs. Form rounded tablespoons of the coconut mixture onto metal baking sheets that are either lined with parchment or a a silpat [affiliate]. I wet my fingers in a little water and smoothed out the top of the cookies. Hayley says this helps the coconut from burning- brilliant! Then just press an almond in the center and bake for 12-15 minutes (depending on your oven- mine was 12) or until the edges are lightly golden. I obviously forgot the almonds with this batch. Once the cookies have had a chance to cool completely (on the pan) dip the bottoms of the cookies in the melted almond bark (in my neck of the woods, it’s called it candiquick) and place back on the cookie sheet. I brushed a little of the chocolate on the almonds that I neglected and placed them in the center. Then I poured the remaining melted chocolate in a re-sealable bag, snipped the corner to create a small hole and drizzled ribbons of chocolate over top. The chocolate hardens and it’s freaking delicious. 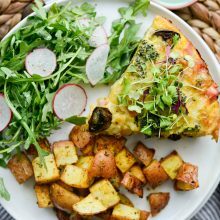 Paired with a fresh cup of coffee, it’s a heavenly combo. 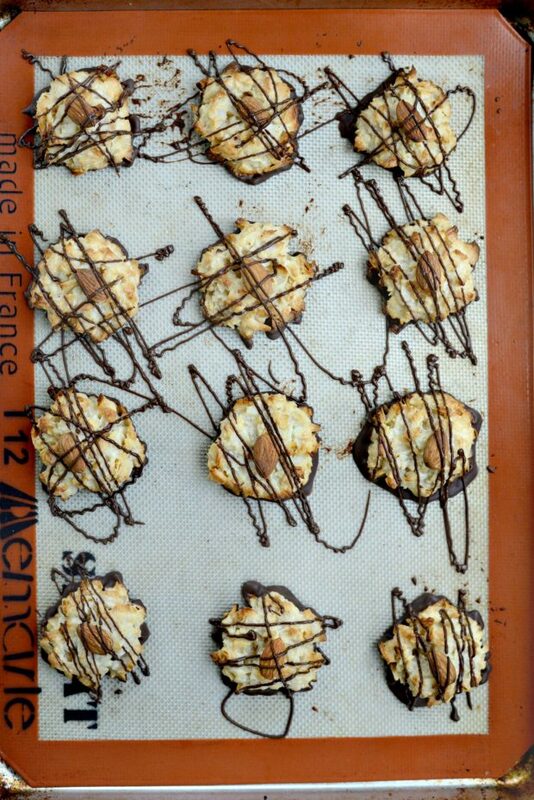 I made these macaroons right before my daughter had 3 of her bffs over for her birthday. Needless to say, 2 cookies were left by Monday morning. We all loved them! Sunday afternoon, over coffee, the girls poured over her cookbook. One of her friends copied down the lava cake recipe and made it that following Monday! There are a TON of desserts, treats and sweets like this in Hayley’s, Out Of The Box Desserts. 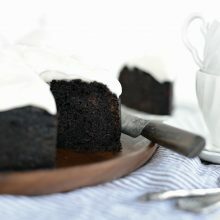 Every recipe has it’s own color photo and a little story about what had inspired her for the recipe. 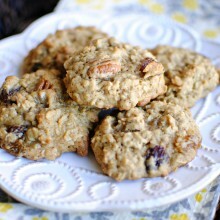 Hayley’s humor is infectious and her love for baking is very apparent in her cookbook and on her blog. Congratulations on the release of your beautiful book, Hayley! 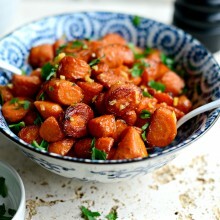 You should be super proud of all your hard work, beautiful photos and the wonderful collection of recipes you put together. Ps. I’m making your Pina Colada Cupcakes this weekend as a farewell to summer. Cannot wait! 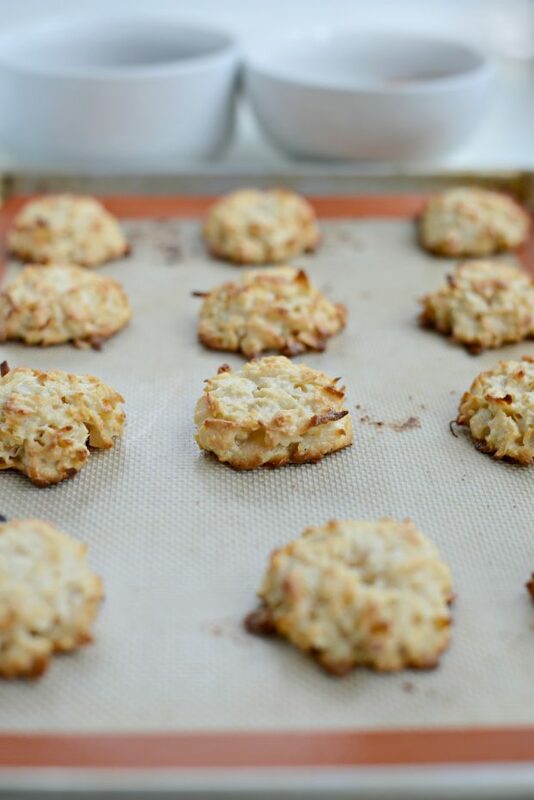 "They're truly meant for coconut lovers since they're unadulterated coconut baked with sweetened condensed milk for a tender, chewy cookie." Preheat your oven to 350 degrees F. Line 2 baking sheets with parchment paper or a silpat. 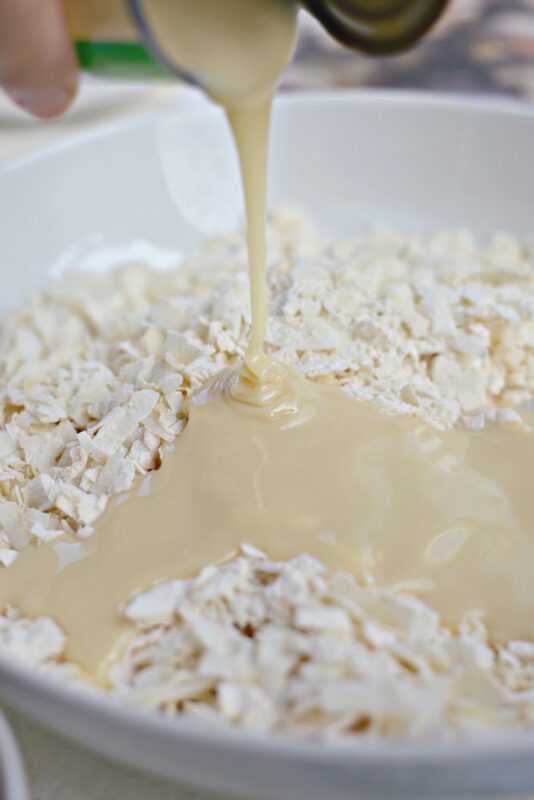 In a large bowl, toss together the coconut and flour until coated. Stir in the vanilla extract, almond extract, and sweetened condensed milk until combined and sticky, about 1 minute. 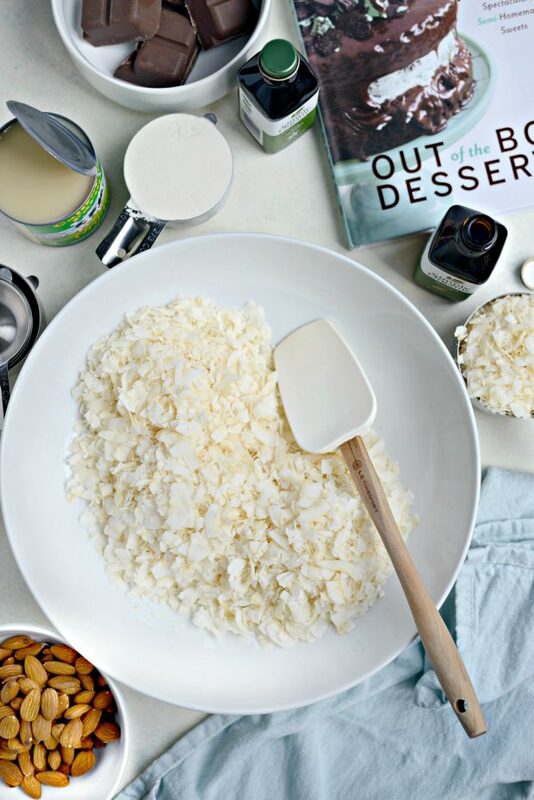 Drop rounded tablespoons of the coconut mixture onto the baking sheets about 1" apart. Use wet fingers to smooth out the tops of the coconut mounds, which will prevent the ends of the coconut shreds from burning. 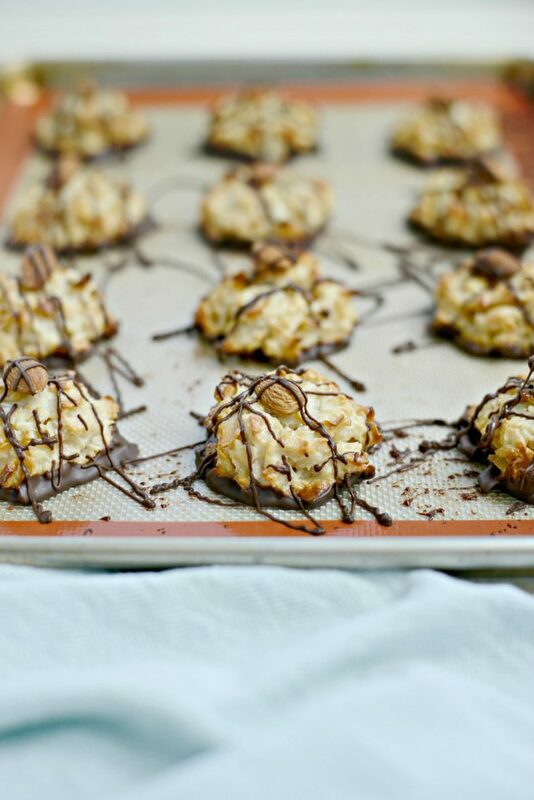 Place and almond on top of each cookie mound. 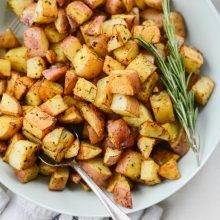 Bake for approximately 12 to 15 minutes, rotating pans halfway through baking time, until golden brown and fragrant. Cool completely on the sheets.